According to Statista, there are almost 4.2 million households in the USA who own an ATV. So if you are one of those people who’d like to keep an ATV in their backyard, this post might be for you. It all comes down to its name. “ATV” stands for “all-terrain vehicle”. It goes pretty much anywhere you want it to go. Simple as that. ATVs are small, open, single-seated motor vehicles with four tires. They have the ability to operate on a wide variety of terrains such as forests, mountains, snow, and other rough surfaces. You can use the same ATV for riding in the sand dunes on Nantucket Island and in deep snow in Vermont or Colorado. That’s the best part – you own one vehicle for all your adventures in nature – any season, any time. What makes ATVs so durable is their body and tires. They have deep-threaded tires that enable the vehicles to be driven on rocky, muddy, and root covered terrains. These vehicles can even survive a turnover and still, in many cases, be okay to drive. You get the best ATV experience when you combine the strong body with its speed. Most ATVs go an average of 40 to 50 miles per hour. Yet, there are some that go insanely fast – nearly 80 miles per hour. Imagine that somewhere in Utah or in Cape Cod with the wind in your hair. Quite an adventure! The first all-terrain-vehicles were not quite like those we see today. These off-road machines first appeared in the 1960s and had six wheels. Because of this, people referred to them as amphibious six-wheelers. Later, they transformed from six-wheelers into three-wheelers so that eventually they could reach their most flexible and at the same time stable form – the four wheels. The first modern ATV was a three-wheeled model called the Sperry-Rand Tricart. It was designed in 1967, and the production began in 1968. It was in the mid-1980s when the four-wheeled models reached the market. If it wasn’t for the movie industry, we probably wouldn’t have known about ATVs at all. Or at least we wouldn’t have been able to imagine them anywhere out of the farm fields. ATVs made their film debuts in the James Bond movie “Diamonds are Forever” and the popular television shows “Magnum, P.I”. and “Hart to Hart”. Thanks to these on-screen appearances, the ATV market grew throughout the 1970s. These vehicles received their first brake lights in the 1990s – before that it was not required for an ATV to have them at all. Good that at least they had brakes because we don’t know how it would have been possible to film that James Bond episode. Imagine that! Yet, even though not all vehicles had brake lights, people had already been riding them out on the country roads… And even started conducting races. The first ATV National Motocross Championship series commenced in 1985. It took 13 years more to issue the requirement for brake lights. Despite being quite a new form of vehicles, in some places in the world ATVs already have quite strong brands. In Israel, they have a generic trademark for ATVs, as they refer to them as “Polaris”. The same way that people in America say “Kleenex” when referring to facial tissues, or the way Europeans say “Pampers” when they talk about diapers. No matter how much you read about ATVs you won’t be able to get even half the excitement they give in real life. If you have never ridden an ATV, please find the nearest adventure park as soon as possible! You only live once, as they say. If you are already a loyal fan and have one in your backyard, then receive our admirations. Such a possession requires both free-spirit and courage. From here on we can only support you by providing more fun things and places to take your ATV to. The rest – you already have! There are literally thousands of miles of trails across the United States to choose from for your next riding trip. This might make it hard for your vacation planning, especially if you let the whole family have a say. There are over 250 miles of marked and unmarked trails in this region. The landscape is so diverse that you will be amazed. From mountain ridges up to 11,000 feet down to trails winding in the canyons. This is considered one of the best places to ATV in the US. There are lovely towns all around the trails which add up to the beautiful landscape. Marysvale, Richfield, Beaver, Fillmore, and Salina are just a few. The best riding season is from spring to fall – the time when you can enjoy the autumn leaves and the spring blossom. We have to give it to Utah – it’s the perfect state for ATVs. We give you two destination from the same state fully on purpose. Plus, you can hit both at the same time! Riding the slick rocks of Moab is like riding on Mars. While most of the marked trails go over hard rocks, you can also find plenty of sand and mixed hard-packed surfaces to ride on. The biggest event held at Moab every spring is the Rally on the Rocks UTV Jamboree. Also known as Glamis. This is the largest concentration of rideable sand dunes in the United States. The three main riding areas that make up the dunes are situated between the Coachella Canal and the railroad tracks. If your kids are just getting acquainted with ATVs, take them there – they will see the full range of ATVs in the dunes. From vintage three-wheelers to high-horsepower buggies, you will see it all. Best part – they are open year round! As a matter of fact, we recommend getting there NOW – the best time to visit Glamis is from October through March. BONUS: Well, we kinda have to mention Wisconsin here, too. Iron county hosts two of the biggest jamborees in the United States. The Memorial Day ATV Rally and the Pumpkin Run. Plan ahead and make sure you visit one of the events on the way to your next ATV destination. Most of the good destinations for ATV riding are either in the Mid and far West or in the upper north of the country. So unless you live close by, we don’t recommend riding your vehicle there. Even if you have your own truck to load your ATV on, the trip will exhaust you before you get there. You would be happier to spend more time on the trails than to waste your time driving. 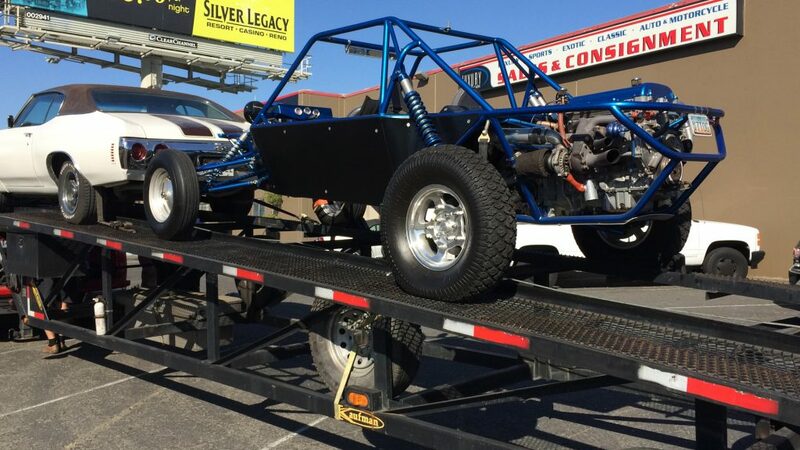 Hiring a professional auto transport company to deliver your ATV to its final destination is always a good option. It will save you time and most likely money, too. By sending your ATV with a professional auto shipper, you’ll save it from unnecessary wear and tear, possible breakdowns, accidents, and damaging weather conditions. You will get enough of these on the trails anyway. Why risk harming the ATV beforehand? The process of shipping your ATV is quite similar to the process of shipping any other small car. What’s great is that since the ATV doesn’t take much space on the carrier, you will be able to get a good price. The exact cost of shipping your ATV depends on the distance that it will travel, type of carrier, and supply and demand situation on a given route. When choosing the company to ship your ATV, watch out for scams – some companies rely on your lack of experience with auto transport to get the most out of you. Other times, they will give you the cheapest price on the market, which could be a sign for poor service. Look for a company that is transparent about its prices and procedures. You can get in contact with the Corsia team to find more details about the process and the preparation. There are people who see no such things as disadvantages of owning an ATV. This is why we should probably call them risks. The probability for collisions and turnovers are high, especially when you consider the uncertainties of off-road driving. Everyone says that ATVs are like rocks and even if they flip over, they will be ok, but this is not an excuse not to be careful. You will always need protection in order to minimize potential harm. To some, this might be a turn-off but imagine what could happen if you don’t wear it. An ATV weighs between 300 and 900 pounds so you definitely don’t want such a giant machine crash on top of you. After all, an ATV is not a bike, but a motor vehicle. And as others say, “as long as it has an engine and tires, it’s gonna cost you some cash”. This is true in the case of your ATV as well, especially if you use it for off-road activities. The unpredictability of the terrain may cause damages to the vehicle in time. This is why you should plan a budget for yearly check-ups and potential fixes. You don’t want any surprises to get your hobby away from you, right? Solo rides can be fun if you are an introvert… or you are really working your ATV in the fields. But the best part of ATVs is when you ride with a buddy. It could be your best friend or your whole family. But the true joy in riding is always in sharing the experience. Especially when it comes to sand dunes or piles of snow to ride through – this is a must for the whole gang. When you choose your ATV, it all comes down to personal preferences and comfort. After all, this is an off-road sport – you have to feel in control so that you can enjoy fully. Choose wisely and always find a friend or an expert to consult with. Remember that the purchase of the ATV itself is only half the work you have to do. Now you need to think about all the add-ons. And if you are really passionate about your new vehicle, you’ve probably started thinking about the first modifications. We suggest you begin with safety gear: clothes, protection, and boots. Start with the simplest – a safety sticker. Then you can think of all the off-road additions, like a dry box and GPS. No matter what you use your ATV for, we recommend you spare some of your finances for insurance. ATVs can be dangerous. No matter how skillful the driver is, the terrain can be unpredictable. So better save up to get peace of mind.